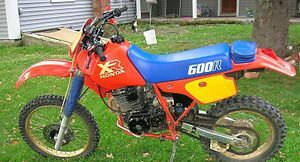 The Honda XR600 is a very popular offroad motorcycle with an air cooled single cylinder, four stroke engine. 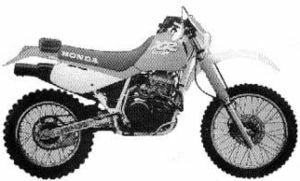 The bike was manufactured by Honda from 1985 to 2000, after which it was replaced by the liquid cooled XR650 model. 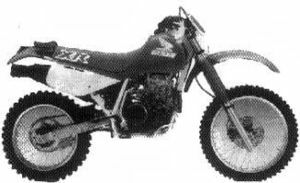 Launched in 1982 as the XR500, three years later the "big" XR inherited the excellent 600cc RFVC engine with four radial valves. 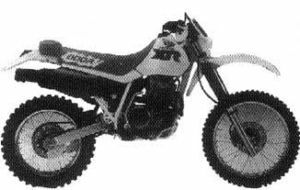 Since then, the XR 600 has progressively evolved, principally in terms of suspension and gaining a disk brake at the rear, but also in detail refinements that have made it the thoroughly perfected machine it is today. Long before HVA and Husaberg, the XR 600 played to the taste of many enduro riders for engines with valves. 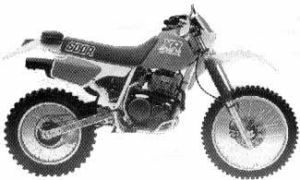 Plus, as a bonus, it had the aura of sterling success in American desert races like the mythic Baja 1000, the Parker 400 and other Mexicali races won at mind-bending average speeds by the likes of Al Baker, Dan Ashcraft, and Bruce Ogilvie. 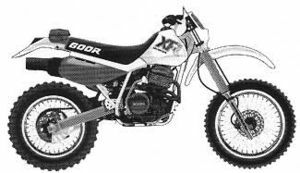 The XR600 forged the legend of the "big thumper" in the shadow of the cactus of New Mexico. Since then it has widened its field of action to African rallies, in which it is the favorite mount of privateers, who want a machine that is both reliable and performs well.Its engine has remarkable flexibility and its frame is well-balanced, but the XR600, physically constrained in the narrow tracks of an enduro, needs wide open spaces to give its best performance. 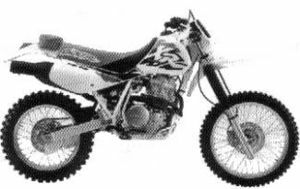 The engine displacement is 594 cc Four valve placed in a RFVC radial disposition with a single camshaft. It has a dry sump lubrication system. 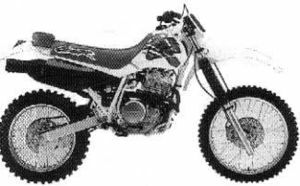 The engine has a compression of 9,0:1 with a bore/stroke of 97x80 mm. 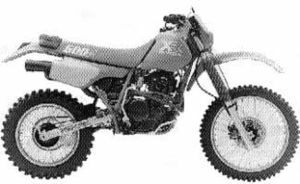 The engine is fed by a 38 mm piston-valve carburetor. The front suspension is managed by two conventional 43 mm forks with compression and rebound adjustability, and in the rear are a Prolink single shock with preload, compression and rebound adjustability. 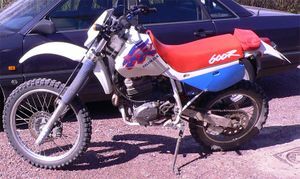 The bike has a five speed transmission and a kick start. 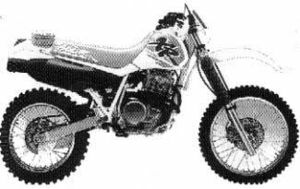 These motorcycles are designed mainly for open and desert racing where speeds are over 50-60 mph. 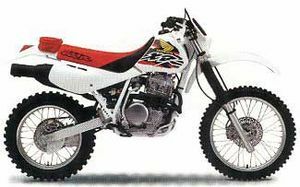 Nonetheless they were used in almost every offroad competition in the world, Enduro, hare scrambles, desert racing, rallies, and motocross (although it is a heavy bike for this discipline). The bike was also favored for sunday drivers, fun trips and legal on-road use where a little modifications mainly in the brakes and the wheels allows for a great on-road machine. 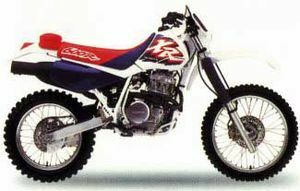 The Honda XR motorcycles are considered very reliable,low maintenance, rugged and dependable machines. 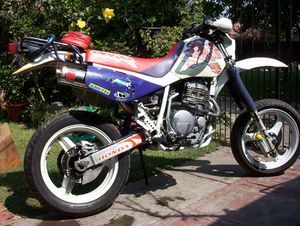 The lack of a water cooling system allows for a hotter running engine but in the other hand make the bike less prone to failure because has less components that can be broken in a fall. 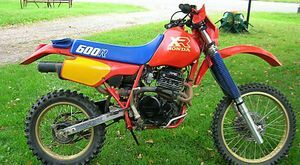 The engine feel is an abundant yet controllable power sensation, the torque starts at low RPM and is present in the entire rpm range, the suspension is plush and comfortable, it's drawback is in tight circuit sections where its size and weight makes difficult to turn and maneuver against more modern machines, the strong points are in fast open sections, sand, hillclimb and rocks. 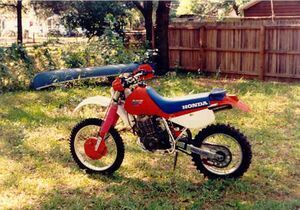 Although the bike is no longer in production, it has many die hard fans along the world and is still present in many off-road events around the globe. This page was last edited on 28 November 2010, at 21:28.